Voice For The Voiceless: Panchita Is at Fur Angels Rescue! Panchita Is at Fur Angels Rescue! Update about the Previous Post Public Announcement Are these Your pictures. This is Panchita, yes Diana Kept her real name, Very foolish of you Diana. Was easily tracked down, This dog belongs to the FUR ANGELS RESCUE this dog is NOT with DIANA PETERS at all. I hope to find out more information about the other two pictures Very Soon. Because Diana Peters needs to be silenced permanently. If you see pictures on Diana Peters Death Row Dog Rescue page, PLEASE report it as STOLEN property and PLEASE inform us, so we can keep EVERYONE updated on this current situation. Apparently she was lost or abandoned at the Flea Market but some jerk called Animal Control to pick her up saying that she was a pitbull. She was taken to the pound and our rescue took her a year ago. She was adopted by a lady and her husband and supposedly loved her very much. 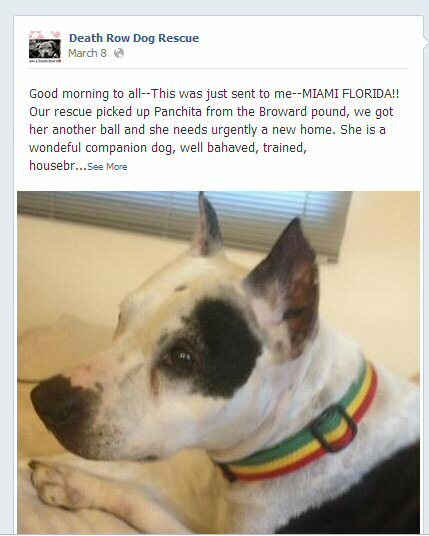 Well, 2 weeks ago I was working in San Juan and I received a call from the Broward Animal Control that Panchita was picked up from street and taken there. I could not believe this so I called the adopter and she said that she had lost her home, that she was pregnant and living with some family members and had placed her 3 dogs at some friends house. 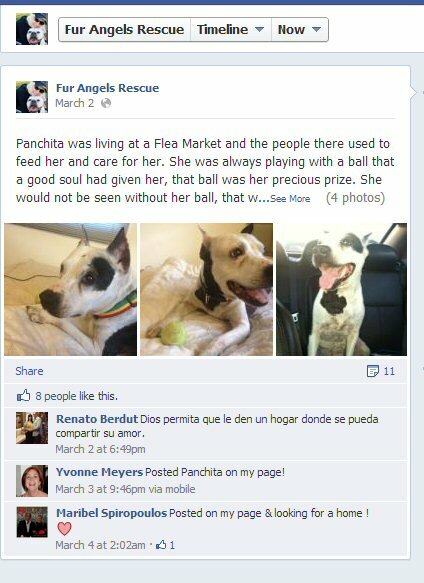 Apparently her dogs ran away from these people's home and only Panchita was found and taken to the pound. Our rescue has Panchita, we got her another ball and she needs urgently a new home. She is a wonderful companion dog, well behaved, trained, housebroken, calm and walks well on a leash. She is a mix between a terrier and an American Bulldog, she is approximately 6 years old. I anyone is interested in giving Panchita a well deserved "forever home" please contact us at 786 368-8005 or email us at furangelsrescue@gmail.com A home visit is required and an application. you can download application from our website www.furangelsrescue.com and email to us. Thank you. God Bless!